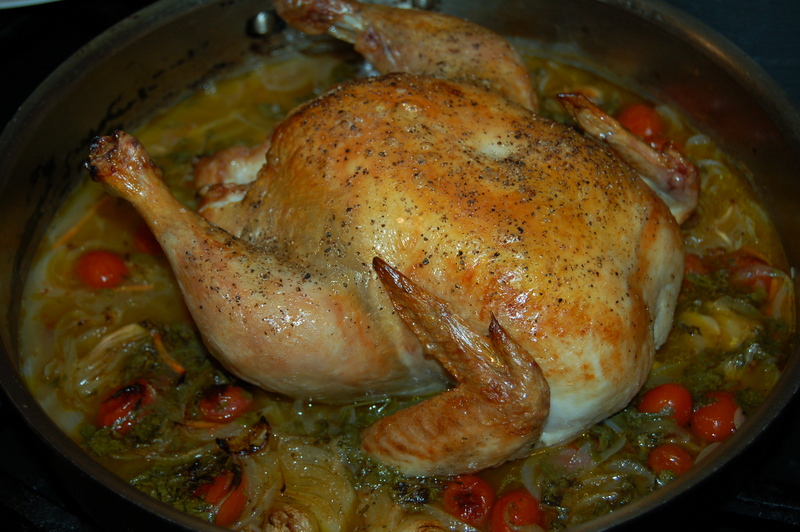 Whole Roast Chicken with Smokey Adobo Broth (serves 4-6) | Crappy Kitchen - Good Dinners! I LOVE roasted chicken and it’s even better if the pan sauce cooks right at the same time. I made this Friday when I was tired after a long week but still needed to make dinner. This was the kind of meal that cooked itself and I was able to sit down with a glass of wine while the stove did all the work! Roast Chicken with a kick! 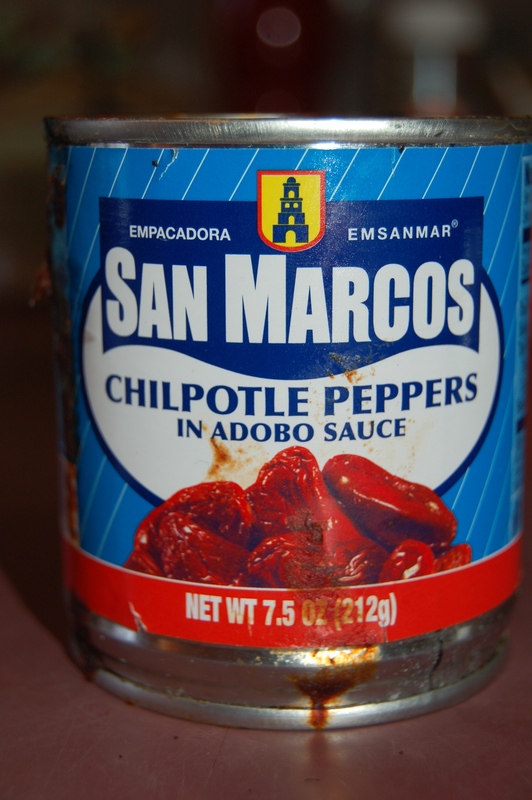 What makes this dish surprisingly different is the addition of chilpotle (or chipotle) peppers. These peppers have been smoked and I buy them in a can of adobo sauce, (find in the international or ethic aisle of your supermarket). 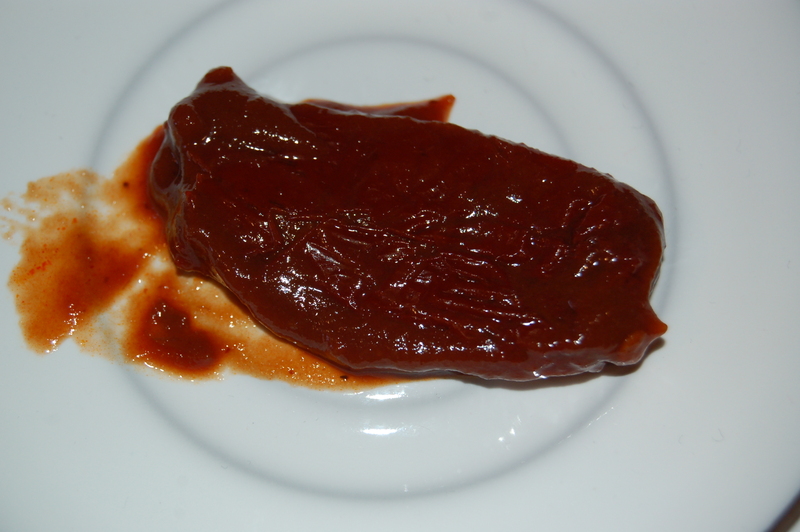 Adobo sauce is a sauce made with a mixture of spices and other ingredients used to preserve the pepper (usually paprika, garlic, oregano and vinegar). The reason I added these hot smokey peppers and sauce to my chicken was because I wanted to use up the last of a bunch of cilantro, so I thought about what would work well with this to make a good broth. Why not go the Mexican route! It was a heart-warming dinner and I served it with rice (which was another super easy alternative to standing over a pot as I used my trusty rice cooker!). Try this yourself if you are a chicken lover like me and also if you want a home cooked meal without actually doing any of the cooking! 1 – Prep all the ingredients (except the chicken, salt and pepper) and scatter in the bottom of a roasting pan or deep saute pan. 2 – Rub chicken with the olive oil and sprinkle with salt and pepper. Place chicken on top of veggies. Place in oven and roast for 1 hour 20 minutes. 3 – Remove from oven and transfer chicken to a board or plate and let it rest for 10 minutes before carving, (you can keep the pan sauce warm by leaving in the warm oven). Check chicken after 1 hour and add more water or broth to the pan if it seems low (up to 3/4 cup). Serve with whatever you like: pasta, rice, potatoes, greens, bread….. Serve with the lovely pan sauce with whatever you desire. This entry was posted in "Blood Type A " Recipes, dinners and tagged 1 pot dinner, adobo sauce, blood type A dinner, blood type a re, chicken, chilpotle, chilpotle peppers, easy chicken dinner, mashed garlic, roast chicken, smokey roast chicken, whole roast chicken. Bookmark the permalink.